It hit me when I was painting (penciling?) 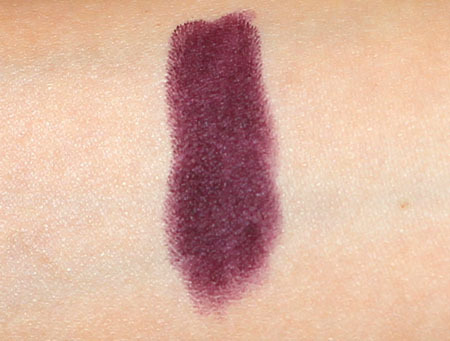 my lips with the new NARS Train Bleu Matte Velvet Lip Pencil ($24) that it was very much like the coloring exercises of yore, where we were supposed to keep within the lines at all costs. You know how your lines would be in the line, but they wouldn't be exactly right? Apparently, age doesn't reflect coloring ability. What you see above is the result of a lot of wiping and outlining with a concealer brush, and even then I wasn't entirely happy with the results. My lips are naturally on the dry side, which might explain the patchiness you see around the center of my lips. I believe with proper exfoliation and ample hydration, it would look much better. However, I don't think a perfectly even application is possible, since our lips have texture and the color tends to accumulate in the lines. While I advocate a good dose of lip balm before applying lip products, I wouldn't suggest a heavy hand when it comes to Train Bleu. Even with a drier surface, the color slips around the lips. I shudder to think how it'll react to a greased surface. I should also note it took two layers of application to achieve this intensity. I couldn't leave it at one layer because it looked uneven on me. 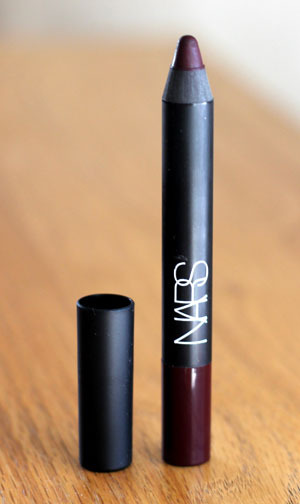 While most matte formulas tend to exacerbate my dehydrated lips, I've had considerable success with the items from the NARS line. While I'm not fond of the Pure Matte Lipsticks and Velvet Matte Lip Pencils, I do think they're the best out of all the matte formulas I've ever tried. I'm hanging on to Train Bleu because I don't have a similar color lying around my makeup drawer, but I'm still not entirely convinced that I should. Tip: When removing the lip color, remember to stretch your lips to get to the color that has sunken into your lip lines. 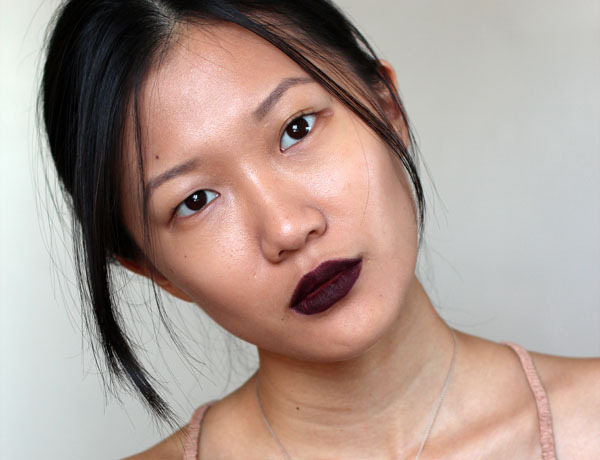 Wow that is one intense lip shade! I've never even tried a chubby lip pencil. I just don't get to excited about matte's especially although I'm intrigued by the new Chanel Rouge Allure Velvet mattes being released. I've been on and off about buying this one because the color is just SO beautiful. I own Bolero, and have some difficulty working with it because my lips are also naturally dry. I exfoliate with Fresh Sugar scrub and then apply a thin layer of matte lip balm before putting it on! Very high maintenance. @PerilouslyPale me too. I'm very intrigued by the RAVs. Part of me wishes they don't work so i don't have to spend a bunch, another part wishes they do so i stop wasting money on mattes that don't work! You are my new favorite blogger!!! I LOVE your posts!!! :) You just got me hooked on LMDB. @Anonymous Aww shucks, thank you! My LMdB obsession is getting ridiculous. But it's really one of the greatest brands to be addicted to! haha , i got train bleu and feel the same ambivalence. 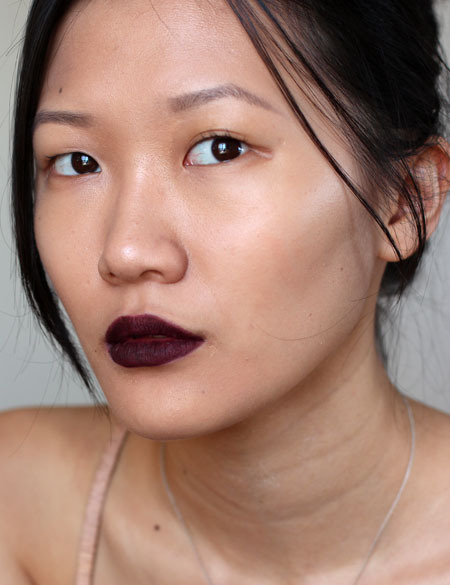 i did put tarte glisten lip pencil over it and it was still intense without being too shiny.